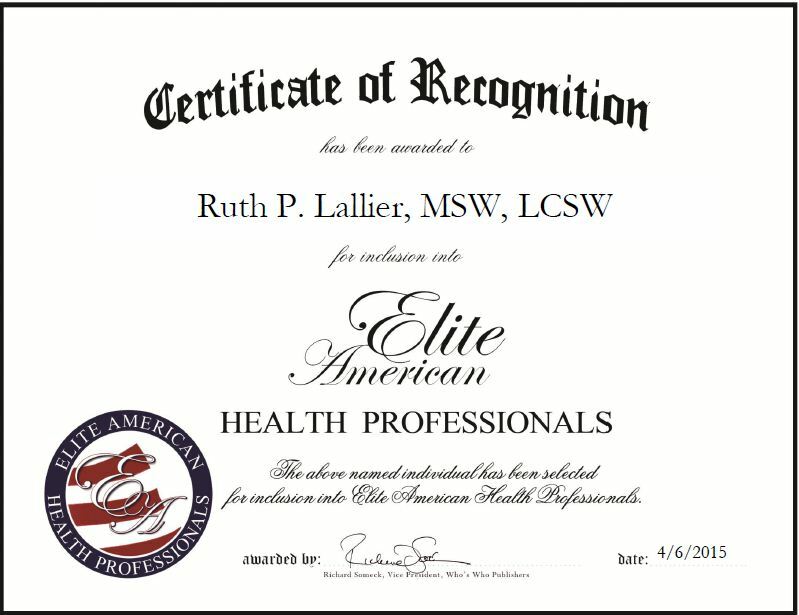 Winsted, CT, April 6, 2015, Ruth P. Lallier, MSW, LCSW, Licensed Social Worker for Ruth P. Lallier, has been recognized by Elite American Executives for dedication, achievement and leadership in mental health. Ms. Lallier has been involved in the health care industry for 26 years and has been in private practice for the past 24. She enjoys working with her clients and helping them overcome emotional issues. Ms. Lallier has extensive experience in clinical social work involving depression and anxiety, and spends her days providing couples, individuals and families with different forms of therapy. She gets great satisfaction out of knowing she is assisting people in living healthier and more balanced lives. Ms. Lallier tailors her services to her clients’ needs in order to enable them to achieve their personal goals. She takes great pride in listening to her clients and developing comprehensive plans that boost mental and overall personal health. A licensed social worker who is certified in clinical forensic substance abuse, Ms. Lallier stays abreast of changes in her field through her affiliation with the National Association of Social Workers. On a personal note, Ms. Lallier and her husband, Mario, have been married for 33 years. They have two sons, four grandchildren and a great-grandson. This entry was posted in Social Work and tagged anxiety, clinical forensic substance abuse, clinical social work, depression, licensed social worker, mental health, therapy. Bookmark the permalink.